Starting from Docker 17.05+, you can create a single Dockerfile that can build multiple helper images with compilers, tools, and tests and use files from above images to produce the final Docker image. Read this simple tutorial and create a free Codefresh account to build, test and deploy images instantly. Once you advance with Docker and would like to create secure and lean Docker images, a single Dockerfile is not enough. This flow assumes that you are using two or more Dockerfiles and a shell script or flow tool to orchestrate all steps above. I use a fork of Let’s Chat node.js application. Here is the link to our fork. Docker 17.05 extends Dockerfile syntax to support new multi-stage build, by extending two commands: FROM and COPY. In order to try Docker multi-stage build, you need to get Docker 17.05, which is going to be released in May and currently available on the beta channel. $ # using --host $ docker --host=:23751 build -t local/chat:multi-stage . $ # OR: setting DOCKER_HOST $ export DOCKER_HOST=localhost:23751 $ docker build -t local/chat:multi-stage . With Docker multi-stage build feature, it’s possible to implement an advanced Docker image build pipeline using a single Dockerfile . Kudos to Docker team for such a useful feature! PS Codefresh just added multi-stage build support, Please go on and create a free Codefresh account to try this out. New to Codefresh? Schedule a FREE onboarding and start making pipelines fast. 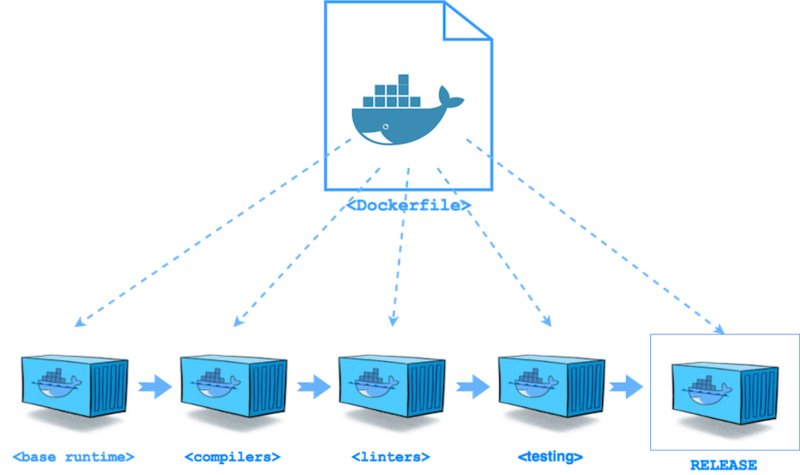 and start building, testing and deploying Docker images faster than ever. Cheers, good explanation and clean Dockerfile! I was thinking there was a way to build only one stage. But it looks like Docker will go through all stages, only the last stage in the Dockerfile is the what will be assigned as the image? This doesn’t help if I want i want to end on an earlier stage. Such as if I have a dev stage, is there anyway to start the container in that stage? Interesting article. Would I be correct in saying this mirrors a CI build pipeline? What is the difference between executing npm install in an intermediate container, then copy it in the final one vs. Just executing npm install in the final container? Why downloading npm packages twice? For a small project it makes no difference, but for real project, it can take minutes (depends on network latency). I’d love to see an extended example of this with a compose file – any chance? This will work only if you configure your lint, setup and test as production dependencies, right? The basic idea is to have 2 folders in base image: one with production dependencies and other with dev. Then test intermediate image could use (copy) dev dependencies from base and release image will copy only production dependencies. If test intermediate image fails some test or lint rule, final release image won’t be built. Fantastic Post! Thank you so much for sharing this kind of wonderful post..!! If the dockerfile step for say linting fails, would it stop it from progressing to the next chain? Your article is very nice… thanks for shairng your information…. Is it possible to launch only a specific stage in the docker-compose file ? I haven’t seen any solution that isn’t running sequentially. We run NPM Lint, NPM tests, image build, … all in parallel to maximise speed. Caching of NPM modules across multiple CI runs – How is this working? For caching between CI builds, we (in Codefresh) are using high-iops network volumes mounted into builder container, so subsequent builds, even if running on different machines will reuse the same volume (ot it’s clone, depending on load and git branching). Very helpful write-up. Thanks Alexei. I went from only knowing a few basics of a regular dockerfile to having one that reduced my image size from 224MB to 127MB by simply using your pattern of copying folders from a “dependencies” stage. My dockerfile is also easier to follow now.